rus_camera has no other items for sale. Very good value for money wide-angle, but be aware of the shortcomings. I was looking for a wide angle alternative on a budget. The wide angle zooms for DX are very expensive and if you want to use a FX lens there are almost no lenses with short enough focal lenghts. The only other alternative was the Samyang 14mm. 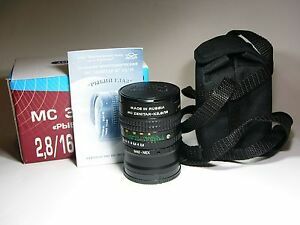 This lens however was cheaper and smaller. Be pepared to shoot in raw and do some post-processing for most images though. I really like: *The build quality - no plastics! *Manual, with a good aperture ring. *Easy to focus (everything in focus most of the time). 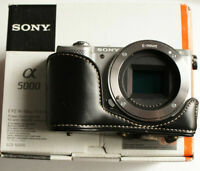 *Very compact, not bigger than a 50mm lens. *Surprisingly good Nikon mount, fits like a glove. *Very wide, about 90 degrees horizontally on DX. *Better projection for people-pictures than the classical rectilinear that disfigures people near the edges. *Easy to transform to rectilinear in e.g. Hugin. Transformed images comes out naturally as widescreen, 16:9. *Colour rendition is nice. *Sharp when stopped down. *Can be used as a macro, good for flower pictures. *The price! Equvalent of a 12mm prime for very reasonable cost. *Used on my old film cameras (FX) it is a full-frame fisheye! Not so good: *Useless wide open. Not sharp at all. At f8 images becomes better, after f11 sharpness is good. Thanks to the short focal lenght handheld at 1/20 sec or shorter is no problem. *Resolution is not on par with Nikon lenses. Especially evident in the corners. *Cromatic abberation (blue) very evident, but easy to correct in in raw-conversion. *Flares if the sun is in the picture. *Not as contrasty as some other lenses, but easy to correct. *It bends straight lines because of projection used. Most of the time not a problem and can be corrected. *Text printen on lens in English. Would have been cooler in russian :-) However, the manual is in russian. English version available for download. I use this lens for three situations: *Widescreen landscapes in good light. Stopped down and with a well composed image you have a really wide lins for a good price. *Party/indoors with flash. Easy to capture scenes in crowded places. Bends straight lines but I prefer this to the disfiguring appearance of really wide rectinlinear lenses. *Can be used to create interesting closeups/macros. This lens is really reasonable price for this quality and I have nothing much to say even I am little picky on lens. Wide enough and compact and light weight. But the weight not like Japanese lens maker this is made by metal and I feel good when I holding this as the lens. Not plastic made. The picture also good enough for my skill and it is interesting effect when against the light. Ghost are not demerit to me and if you use this as taste you can create good picture with it. One point regret is filter this is a fish eye lens so it usually can not attach filter on front but if I could attach it on front I will be more satisfy. Instead filter can attach on back element. I never use this back element filter but one day I will use it. So I am satisfy with my copy and I often carry it. Most impress is use this with full frame camera and it will be really interesting shots. When I Using This Lens i was surprise with the image i've got. Sharp with cool rendering tonal, if u use Full frame u can play ur composition an many angle. trust me it's cool lens & u must have.